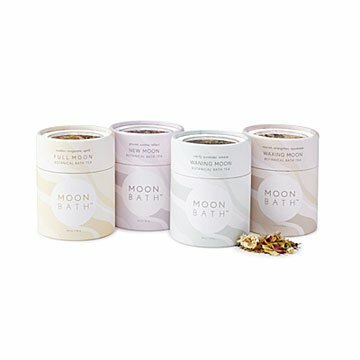 Bath tea handcrafted for each lunar phase? We may have outdone ourselves, but oh it's luxurious. If you read your horoscope daily and believe Mercury's last retrograde made everything wonky, these might be your new favorite find. The herbal ingredients in this extravagant steeping teas just might strengthen your spirits, lift your mood, and soothe you during the new, full, waning, and waxing moons. Here's how it works: Use the lunar calendar (sold separately) to pick your tea, then steep it for 20 minutes. Strain the herbs and pour the tea into a hot bath. Soak, and let the moon guide your soul. The set of four makes a great gift for friends who live by their zodiac sign, or anyone who loves a restorative bath (*raises hand*). Handmade in Colorado. Dakota Hills and Sierra Brashear’s company was born out of a common passion: their belief in healing with plant medicine. They started by exploring the ancient practice of “botanical soaks”—putting herbal and floral teas into your bath to make it even more relaxing (and heaven-scented). “We found that by recognizing the intrinsic relationship we have with the lunar phases, the elements, and seasonal shifts we could reconnect ourselves with nature.” Today the duo creates products they describe as “modern alchemy.” The designs are all natural, intentionally crafted, and usually draw on an age-old practice or ritual. You can find Dakota and Sierra creating a new design or connecting with the earth in Boulder, Colorado. Steep contents of jar in standard size (34 oz) French press filled with hot water or on stovetop for 20 minutes. Strain and pour into bathwater. Immerse yourself, set an intention and tune in to your breath.